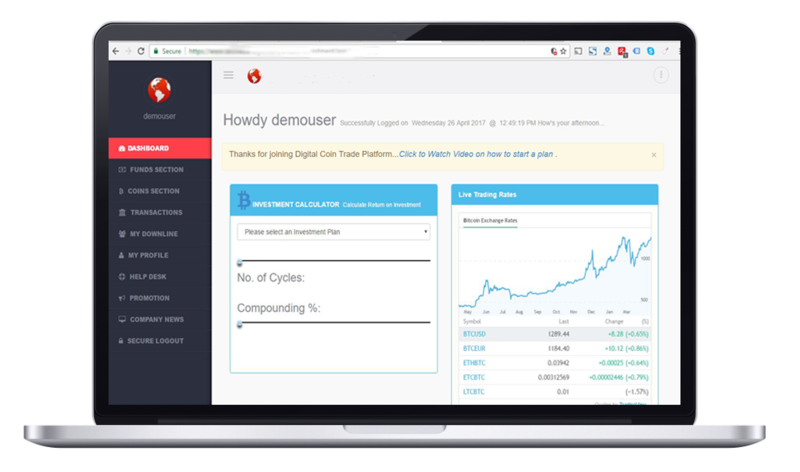 Digital Coin Trade:Investment Program:e-Currency Exchange Platform. Buy and Sell Crypto Currencies With Local Currencies. Exchange one crypto currency for another via secured tokenization mechanism on crypto currency swap trade. Secure the value of one down trend crypto for another up trend crypto via token deposit and withdrawal. Trade securely via tokenization of supported crypto currencies to single token. Instant crypto to crypto exchange for supported digital currencies. Easy crypto liquidation to supported fait currencies. Please note: Fait takes 3 Business Days for completion and remittance, there are deposit and withdrawal order limits to align our service availability and in accordance to the KYC & AML policies. Make convenient purchase of DCT tokens via credit cards and exchange token for supported crypto currencies. Opening partnerships globally to facilitate over the counter and easy access to crypto to local fait conversions. Convert 2000+ Crypto Currencies and 100+ Faits. How To Execute e-Currency Exchange. For payment option, depending on A You want to convert a crypto currency supported for deposit to a crypto currency we support for withdrawal. B You want to convert your fait deposit into the crypto currency supported for withdrawal. You need to make use of preferred deposit payment option. Your processed order should reflect on your CASH BALANCE WALLET, next click on the FUNDS SECTION where you will need to click on the withdrawal tab, to make withdrawal in either fait or crypto currencies supported by the platform. In order to provide more accessibility for crypto liquidation, we have a partnership program for local SMEs to offer an OTC service to purchase back DCT tokens for local fait, which in turn are recycled back into the partnership program. DCT token are sold to partners on their websites or over the token by DCT members that want to cash out in local fait currencies. With this innovation to empower SMEs, we will be able to offer easy liquidation of crypto currencies.